In 1944, New York’s Museum of Modern Art staged its first and up until recently, the only exhibition dedicated to the things we wear on our bodies titled Are Clothes Modern? 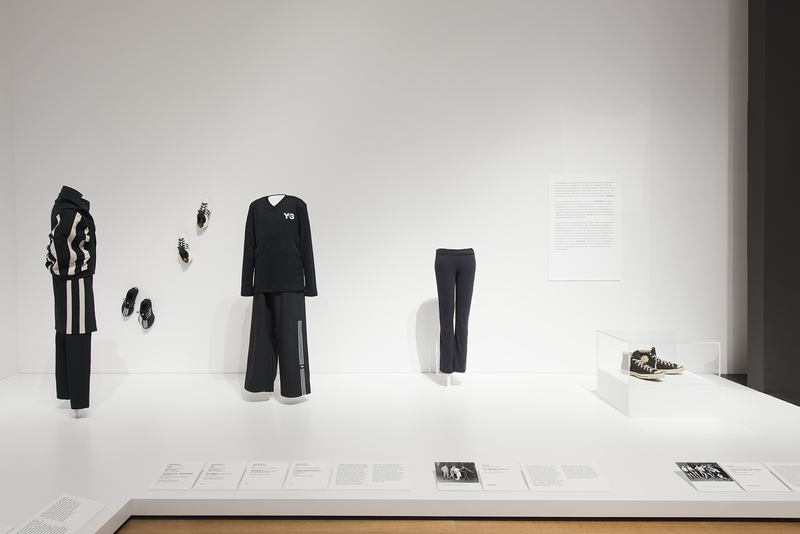 Responding to this seminal exhibition, curated by writer and architect Bernard Rudofsky, MoMA’s Architecture and Design Curator Paola Antonelli has staged a show titled Item: Is Fashion Modern? After visiting the exhibition, Address contributor Kate Sekules asks: is this a modern exhibition, and is it about fashion? Museum of Modern Art wants to sort of apologise. The museum with a fair claim on being the ultimate authority in modern – after all, this is New York, capital of the World – has neglected clothes for 73 years. Apart from owning a Fortuny, it has looked the other way ever since the Bernard Rudovfsky-curated show Are Clothes Modern? in 1944. So now MoMA gives us the run of the entire sixth floor, and 111 (which I think of as the corduroy number, though I doubt they do) significant ITEMS. It is all enormous fun, let me start right there. But here’s a rhetorical question back at you, MoMA: is this exhibition modern? Is it even really about fashion? Its genesis, said MoMA’s Architecture and Design Curator Paola Antonelli, was a notebook she’d been keeping for years on “garments that changed the world.” Then, with her Curatorial Assistant Michelle Millar Fisher, some MoMA juniors and an Advisory Council of 15 fashion personages, she set about pulling pieces, applying the all-purpose MoMA rubric of ‘archetype, stereotype, and prototype’ to each. The intention was to situate them in context with each other, with themselves, with us. 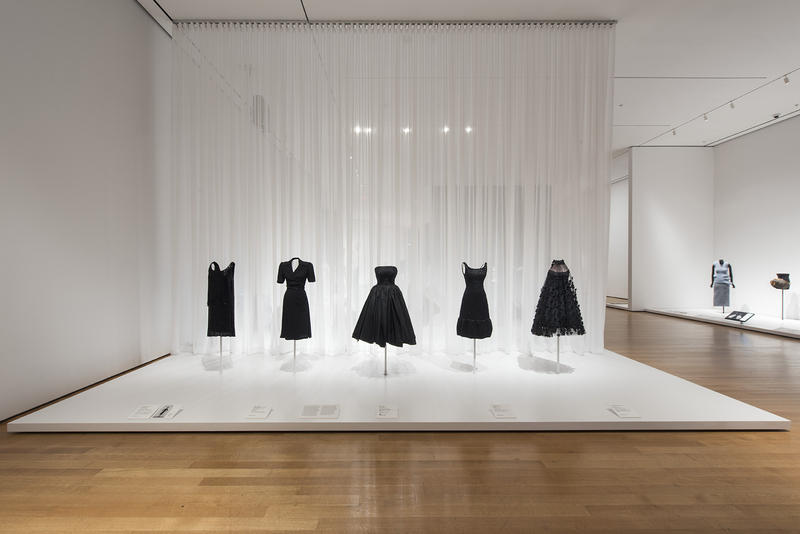 The stereotype is the standard version, the archetype adds its history, and the prototype is, as it sounds, a new version: MoMA has commissioned 28 of these “to jump-start a new life cycle for the garment,” as Antonelli puts it in her catalogue essay, Who’s Afraid of Fashion? Meanwhile, uptown at the Metropolitan Musuem of Art, curator Andrew Bolton did not title his Art of the In-Between essay “Who’s Afraid of Rei Kawakubo?” Nor is the next catalogue intro going to be: “A Hockney Is Pretty But, Don’t Worry, It is Art”. And therein lies a bit of a problem. Let me show my hand here. I went, alone, to the Press Preview, without context or prejudice. I didn’t even read Antonelli’s essay, nor the section wall texts that start: “When we put on clothes, we change the shape, texture, and outline of our body,” then go on to tour the Items, picking out 50 words in bold: fluidity, gender, standards, comfort, deviations, ecosystems, Existenzmaximum (I don’t know either), modesty, rebellion, agency, and so on. And, as I said already, I thoroughly enjoyed myself. Then I talked to a very learned professor at my Costume Studies course, and I could not get her out of my head. It boils down to her wondering: Why did they give this important show to the design curator? And now I am torn. On the one hand, I’m a lifelong clothes junkie, with decades of immersion, both amateur and professional, mostly in vintage, currently writing a book about the life of clothes: ie. I’m a rank enthusiast. On the other hand, now I’ve gone academic as a postgrad scholar of fashion history and theory. As I enter this formal framework for the subject I love, I am suddenly seeing it from both sides. And so I am seeing this exhibition both ways. From the latter, formal, perspective, the beginning of the show looks like this: Really? You’re doing ‘fashion’, so you pander to the stereotype (not the one in the essay) by starting at the Little Black Dress? For those raising this discipline to the analytical, multi faceted level of discourse it deserves, that is indeed banal. From the perspective of me, that Tuesday, it was hilarious. Little Black Dresses! And number two, a beyond perfect 40’s Charles Creed I’d never seen and very much wanted to steal: it was satisfying. Then around the corner behind the scrim, a second line of darker little black dresses act like the rhythm section, Nervous System’s 2013 laser-cut Kinematics Dress (I wished for an Iris van Herpen, but oh well), Rick Owens’ Parrino Tunic and Pom-pom Bud Shorts, complete with footage of the amazing Steppers from that spring/summer 2014 show, and one of the prototypes, Little Black (Death) Dress, a wearable coffin, basically, by Australian artist Pia Interlandi. There is also, logically, underwear in the first room. I disagreed with, and walked quickly past the Wonderbra, with Eva Herzigova going “Hello Boys” in 1994, but Lucy Jones’s Seated Pantyhose, or wheelchair tights, looked interesting next to some Spanx on a specially lumpified mannequin, and a thing I took to be a humidity measuring device but turned out to be a Touche Éclat (that YSL gold tube of face “illumator” . It’s ubiquitous. I own one. I’m not sure why) stuck to the wall. Again, this seemed amusing at the time. There is just so much of this exhibition, and in such a generous acreage, you simply cannot be bored. If you wonder – and, while I worship Margiela, I did wonder – why there is an entire case of Tabis, you just walk on by, and quickly arrive at, say Rudovsky’s row of figures impossibly misshapen according to period fashions, the famous “Body Idols” from the 1944 MoMA show, adjacent to an MTV fanny pack (ouch, but I see what they mean) contrasted with Vivienne Westwood’s 1996 Vuitton bum bag, next to a slightly disconcerting out-take from the Met Art of the In-Between’s most Instagrammed display, a line-up of ‘Lumps and Bumps’. There are stunners, such as Issey Miyake’s futuristic A-Poc Queen Textile, artfully festooned in all its scarlet glory, and a circus-silly but adorable ‘prototype’ jumpsuit by Irish designer Richard Malone with a Stephen Burrows cloth-of-gold strapless number escaped from Studio 54. There are keffiyehs and saris and dashikis and guayabaras, kente cloth, Dutch wax, doorknocker earrings and a wall of kippot, which I know as yarmulke and they didn’t tell me why I shouldn’t. 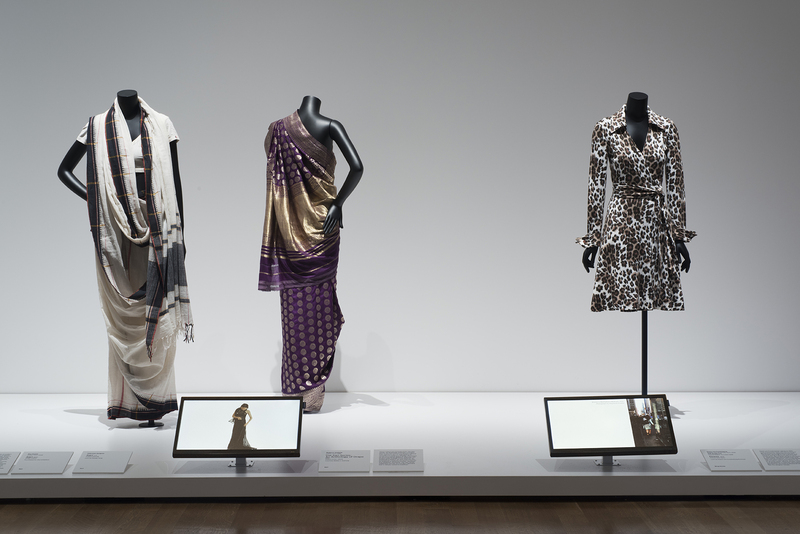 You cannot accuse the curators of being Western-centric, but they can be accused of clunkiness: pairing a hijab with the burkini makes sense, but I do think it’s a bit insulting to the 4,000-year history of the sari to imply equivalence with Diane von Furstenburg’s tired old wrap dress. Also, I don’t know why you’d commission the ‘prototype’ guayabera from a Japanese designer (Ryohei Kawanishi), and display a pair of 1930s cheongsams without any explanation for their miniature size, nor really any context at all. Elsewhere, though, context is a highlight. A quartet of head wraps – a gele, a doek, a Thea Porter-ish pre-tied one and a drugstore-ish do-rag – sit with an effective nonverbal slide show (New York Fashion Week/the Three Kings/1941 Pour Elle/Western Wall, Jerusalem/cardinal’s crest/Brueghel/ Creole woman/Sikh men/Anne Klein, 1975) and the Steve Jobs turtleneck (a 1980 Miyake—buy a ‘limited edition’ in the gift shop!) comes with a fantastic, thoughtful, artful film by Hana Tajima, even though (I don’t think I hallucinated this) it was commissioned by Dove Soap. Such a brand tie-in fits right into a show that blatantly engages with the commercial nature of fashion, giving corporate names top billing: Nike, Converse, Teva, Speedo, Levis, Hanes, Gore-Tex, Rolex, Fitbit, Swatch (those last two annoyed me, even in my euphoric crush stage). This befits the context MoMA has created, more Design than design-er. Very few design-ers are given their own ‘item’ category – just a dozen by my count: aforementioned Miyake (twice), Comme des Garçons, Margiela, Diane von Furstenberg and Yves Saint Laurent (make up + Le Smoking); then there’s Chanel (as perfume and a little black dress), Pierre Cardin (as Space Age), Rudi Gernreich (Unisex), Yohji Yamamoto (in his most commercial Y-3 aspect), Ralph Lauren, Polo, Thea Porter representing the caftan and abaya and Donna Karan, as Seven Easy Pieces. No designer is named in a title – presumably, a conceptual decision made early on. More tragically, the great, great Paul Poiret is hidden behind harem pants. And, as suggested by this insult to art, what gets louder now that I’m thinking back through the show, is that ITEMS is really not about not fashion qua fashion. The second half seals that deal. I truly enjoyed what I call the “rich lady” or “gold digger” section: a corner of glass vitrines containing a starkly-spotlit fur coat, and diamond rings, and a (brand alert) Cartier Love Bracelet and Jane Birkin’s actual Birkin, plus a fabulous artisan-made series of mutant handbags by Mary Ping, and I appreciated the Aran and Breton sweaters, each with their elegant prototypical versions (by Laduma Ngxokolo and Unmade), but the most-Instagrammed group of all, the image I keep seeing around, is the most boring and un-fashion ITEM in the whole show: sports jerseys. I don’t get it. They are so far from being fashion that they offend the eye, they are the insult known as athleisure. Yet people love them, apparently. 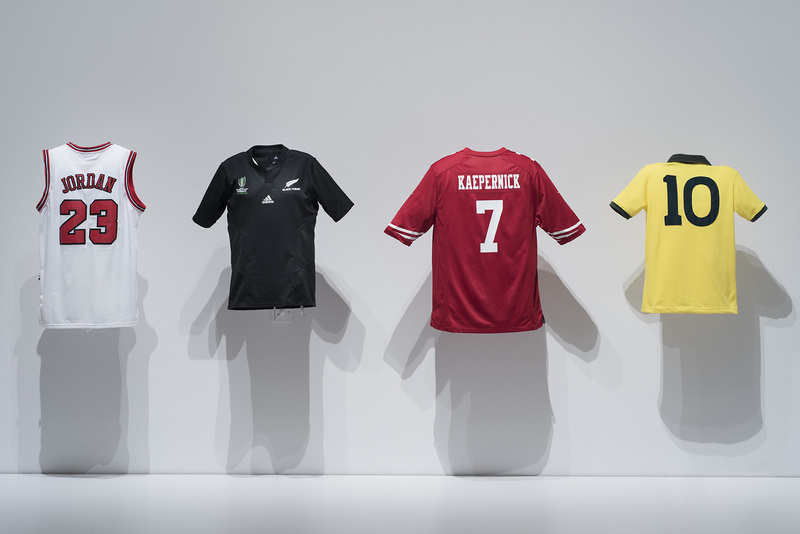 They get all the way through to the last hall and then post Colin Kaepernick’s football shirt – admittedly he is the player righteously famous for ‘taking a knee’, which means something. But as a fashion item, it is vapid. Earlier on, another red sweater takes the stage in a singular display, barely annotated. It is the piece Antonelli describes as one of the most important in the show. It’s a hoodie. In a conversation with MoMA Director Glenn Lowry at the press preview she recounted its history: created to keep college athletes warm in the 1930’s, appropriated by their girlfriends in the 1980’s, adopted by urban skateboarders and graffiti artists, and now emblematic primarily of Trayvon Martin and all that he symbolizes. At the Abcedarium last year, part of a colloquium precursor to this show in which 26 notables gave seven-minute presentations on their letter-ITEM, Pyer Moss founder Kerby Jean-Raymond and DeRay McKesson of Black Lives Matter gave H-is-for-Hoodie in film and silence. It was utterly devasatating. Why that is not aired as context for this 90% cotton 10% acrylic 1980’s reverse weave Champion I could not say. Secluded on a matte black wall, it may not be eloquent enough, especially not when the Swatches, and afterthought paper miniskirts (should have been Mary Quants, obviously) are lurking nearby. This belongs to the “is the fashion exhibition modern?” conversation, or: what is a museum for? MoMA is mounting displays from a world which, as the professor implied, it may not sufficiently understand, or care about anyway, yet surely education is a fundamental purpose of a museum? It should know more than us. There must have been some agonizing over how the hell to exit the 111; which to concecrate as the last ‘1’. 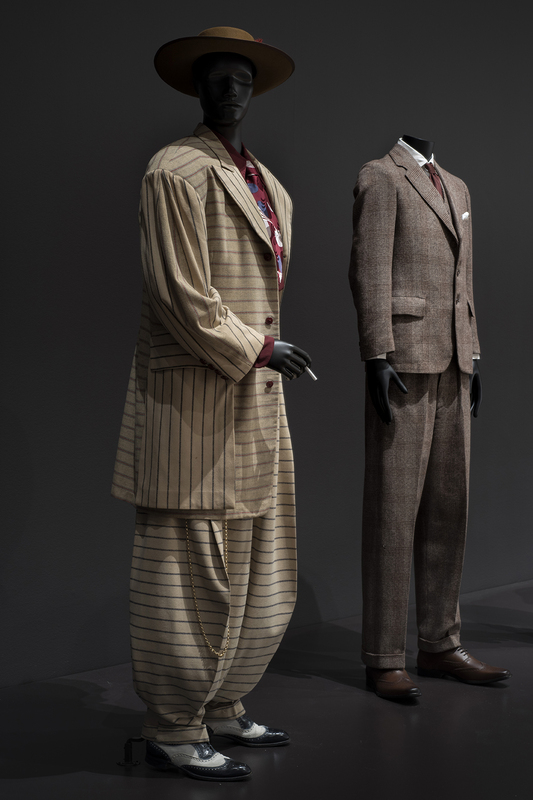 You reach that spot via a back wall of iconic male costume, S-for-Suits, with one of the garment highlights yelling from the middle in the charismatic form of a near-extinct 1940’s Zoot Suit, a horizontally-striped balloon-legged wool twill lunatic on loan from Los Angeles County Museum of Art. It’s stunning. And then the chosen ‘1’? White T-shirt. A Hanes white T-shirt. It is the most tedious garment, redolent of fast fashion nightmares. It was chosen, said Antonelli, partly in response to a comment of Glenn Lowry’s that these days the guy in the suit might be the bodyguard while the one with the power is in the T-shirt. Yes, okay, a white tee is the most universal of garments; everyone has at least one (well, I don’t), though why is a wearer’s power the salient signifier? And why end on these masculine concepts when fashion has suffered centuries of denigration in the girly ghetto? Let’s acknowledge and celebrate that. The wedding dress, the traditional closer of every fashion show – and arguably of a woman’s independence – would have been amusing. That is not the MoMA agenda now. This show will not “help you to ignore” shoppable tweets and Gucci ads and Anna Wintour; it has no discernable opinion about your personal wardrobe choices. However, since we are hopelessly lost in our own 21st century “maze of irrational clothing habits,” maybe getting in bed with Hanes et al without commentary is disingenuous. Hanes wasn’t among the labels found in the rubble after 1,137 people were crushed to death and 2,500 injured when the Rana Plaza factory collapsed in 2013, but Hanes stockists WalMart and J.C.Penney were certainly implicated. I don’t think mass brand fashion deserves so much tasty limelight. After all, in Glenn Lowry’s own words: “what we wear, writ large, affects who we are.” And in Antonelli’s: “We want people to come into the exhibition recognizing anything they wear at any time can be a symbol and can be world changing.” Our fastest fashion method of changing the world is to refuse to buy fast fashion, not to enshrine it in mighty positions in museums. So, bottom line, is this a modern exhibition, and is it about fashion? Well, there’s nothing old-fashioned about it. It’s all adjacencies and suggestions and clean staging. The stereotype, archetype, prototype framework represents bang-up-to-date semiotics. The show is exuberant, splashy, confident, and even after picking it apart, I really did love it. But fashion? I already said it: not so much. Demoting designers to the small print is perverse, and there are too many omissions (Dries and Stella and Versace are somewhere in there, but I don’t remember any Miuccia, or McQueen, or McCardell, or Marc, no Gaultier or Schiaparelli, or Dior, or Alaia or Raf or Jil or Ann or… I could go on. And on). The Professor’s qualms still ringing in my ears, I agree, this show is decidedly about clothes as Design. 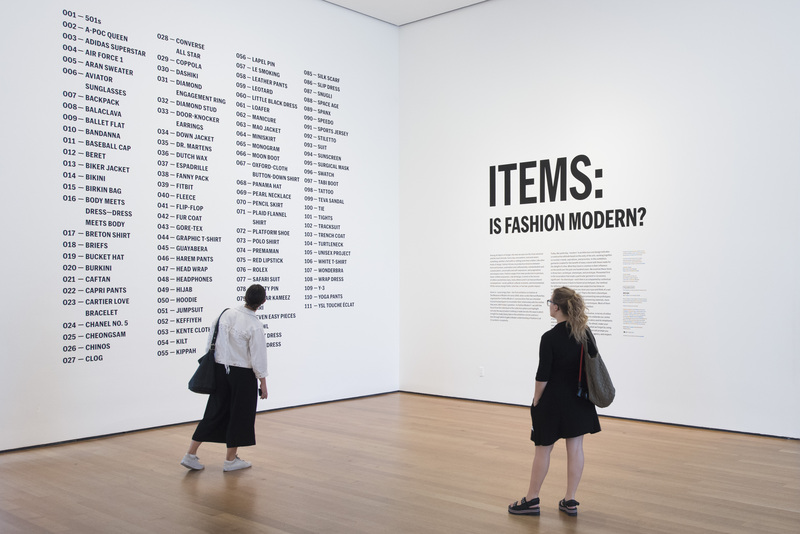 Even more of a fashion diss than that – and the 73-year lacuna – though, is this: our rapidly evolving discipline of fashion, or clothes, or dress, or costume, or whatever it’s termed: at the Museum of Modern Art it really ought to be: Art. Kate Sekules founded Refashioner, the first curated personal wardrobe trading site (with mandatory clothes stories), and Visible Mending, an online/IRL hub for radical sewing. A former journalist, she is writing a book that is more or less a clothes memoir and completing an M.A. in Costume Studies at NYU, with focus on the history and future of mending and reselling. She wants to bring old clothes out of the closet.